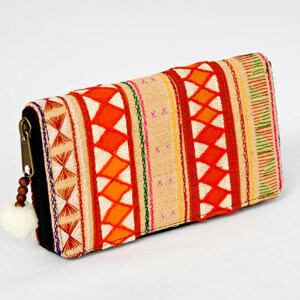 A stylish purse handcrafted by the Akha ethnic minority women. 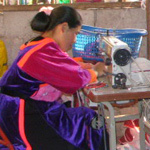 The stitched and appliqué decoration features diamonds and various geometric motifs. The interior is lined with cotton and hides one zipper pocket with zipper to hold coins and small items secure, six small pockets and four credit card pockets. 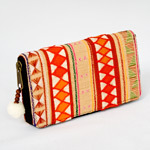 The artisans close the purse with a zipper and attach to the zipper a lovely pull made of mango wood beads and cotton pompom.